Biomedical engineering is an exciting field that’s on the cutting edge of innovative medical advances. Biomedical engineers design prostheses, artificial organs and pharmaceutical products that directly improve quality of life for millions of people. They also design and manufacture diagnostic and therapeutic devices and imaging equipment that give doctors and medical researchers the tools to identify and treat a wide range of illnesses and injuries. A career in biomedical engineering is an excellent option for someone interested in medicine, but who may prefer working behind the scenes rather than directly with patients. 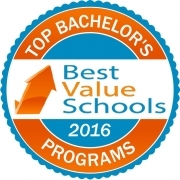 It’s a high-paying, rapidly advancing field, expected to grow 62 percent through 2020 [Bureau of Labor Statistics]. Biomedical engineers are employed by industry, including multinational corporations and start-ups, as well as government agencies, hospitals and academic institutions in the forefront of research. 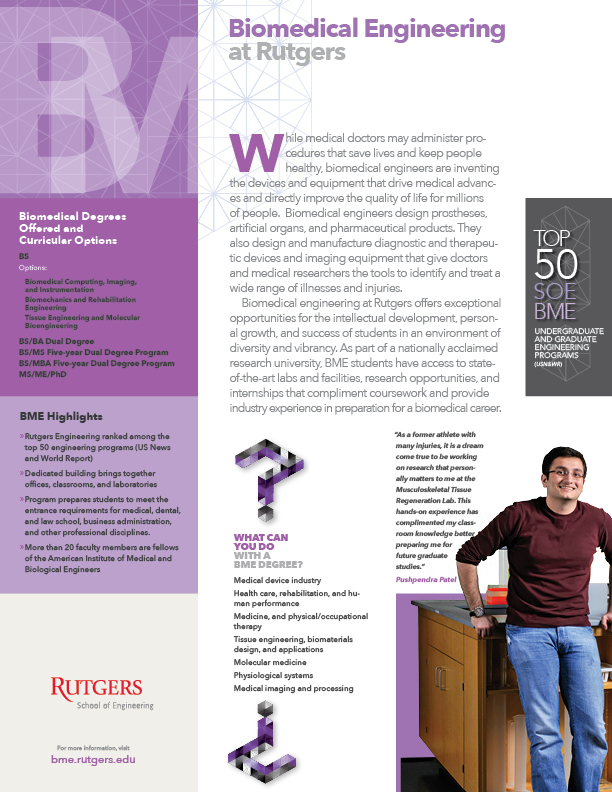 Why Rutgers for Biomedical Engineering? 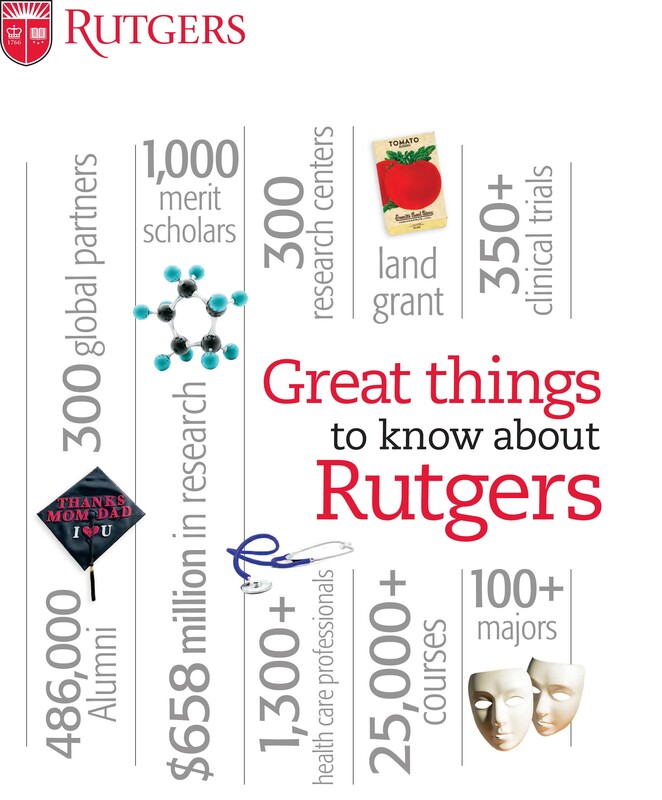 Rutgers University is located in the heart of one of the world’s highest concentrations of health care companies. New Jersey is the fourth-largest biotech center in the US, home to more than 130 biotech companies; nearly half of the nation’s $30-billion private health research takes place here. This gives Rutgers unparalleled access to leaders and innovators in the field as well as to resources, including research funding and internship opportunities for our students. We are proud to have executives from a wide range of companies including Siemens, Johnson & Johnson and Merck on our industry advisory board. The department’s 30 professors and more than 40 affiliated faculty associates are recognized leaders in fields such as molecular, cellular, and nanosystems bioengineering; biomaterials and tissue engineering; biomechanics and rehabilitation engineering; neuroengineering and neurotechnology; physiologic systems and bioinstrumentation; and computational bioengineering and biomedical imaging. Our state-of-the-art biomedical engineering building features core facilities for genomics and protenomics, tissue engineering, advanced microscopy, biomedical optics, microfabrication, nanotechnology, animal study, high-performance computing and an open lab design to facilitate interdisciplinary collaboration. Research funding of core faculty exceeds $7 million annually from the public and private sectors, including the National Science Foundation, the National Institutes of Health, the US Department of Defense, leading health foundations and industry. The department’s Industrial Internship Program provides students with valuable work experience, where they apply their coursework and skills to a wide range of paid engineering positions at some of the nation’s leading biomedical corporations. Many students extend these experiences into collaborations on their senior design projects and also into full-time positions after graduation. Engineering students who have completed their junior year may be eligible to participate in the School of Engineering’s Cooperative Education Program, with six-month paid positions at leading companies in the region.